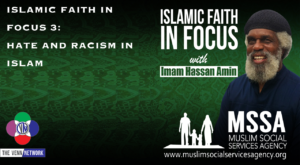 On this episode of Islamic Faith in Focus with Imam Hassan, following on last week’s episode, he addresses hate and racism from the Islamic perspective. He goes on to recall an assignment that he would give to his students in his sociology class where they had to interview another student from a different ethnic background. He noticed that with his students this assignment would breakdown various walls and expectations, he goes on to say that one student who did this assignment is still good friends with another student to this very day. The Imam goes on to quote another verse from the Quran pointing out that we, as Muslims, are taught that it is wrong to dislike someone based on the color of their skin – we need to treat every human equally, regardless of their race, sexually orientation, gender, background, or faith. Make sure to subscribe to this Venn Network production – Islamic Faith in Focus with Imam Hassan. This is surely one of the best podcasts to to if you are looking for facts about Islam and if you want to know what Islam is all about. Islamic Faith in Focus Podcast delivers important information about Islam to you weekly, so make sure to subscribe to this Muslim Talk show that isn’t just for Muslims!